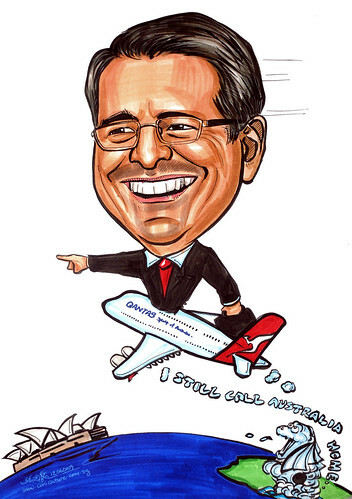 AustCham is looking at having a caricature for one of our Board Member. The idea we want is for the gentleman to sit on the front tip of the A380 flying out of Singapore. The photos of A380 is attached and I think we prefer the plane to fly the opposite direction ie towards Australia. On the left of the picture is island of Singapore with merlion. The background should be blue sky with the sun rays without the clouds. Looked rather empty without the cloud in the background. One concern here was the subject's broader neck (more like double chins) in the photo provided by the client. I 'squeezed' it down to make it join better to the shoulder/body. In the end, the feedback from the client was that the subject's face looked elongated, instead of squarish. However, if I extend the neck line down as in the photo, the neck will 'reach' the subject's elbow area in the caricature. I think this will look very wierd. The previous job for them has no such issue, as that subject's jawline was distinct. Lesson learnt - Do not to choose such photo (no distinct jawline) for the caricature next time. We, the artists, can visualise the awkward part, but not the layman like the clients.